There is plenty to say about the content of the speech, which is a study in the new climate denialism—the idea that we can take effective action on climate change while at the same time ramping up oil and gas production and building new pipelines. But first, consider the source. Of course, these holdings are likely just the tip of the iceberg. 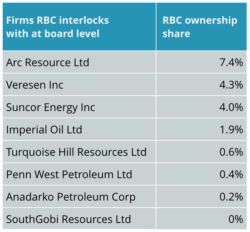 We haven’t looked closely at RBC’s investments in fossil fuel corporations outside Canada—though a cursory review of its Global Energy Fund shows it has significant investments in some of the largest fossil fuel companies in the US and globally. For example, 6% of the Fund’s equity holdings is in US-based Continental Resources (one of the largest producers of the highly volatile Bakken crude oil, of the variety that exploded in Lac-Mégantic, Quebec), 5.5% is in Exxon Mobil Corp (now under investigation for fraud for its pivotal role in the climate denial industry), 4.9% is in French multinational Total SA (fined for corruption earlier this year for its role in the UN oil-for-food scandal), and 3.2% is in Halliburton (a major provider of oil and gas field services)—to name just a few. We have yet to analyze the fossil fuel holdings of RBC’s numerous major subsidiaries. When its CEO says “we cannot get to the economy of the future without using all our resources, smartly and sustainably,” we should ask the obvious question: how can Canada possibly use all its resources and be sustainable? Last week NASA’s chief climate scientist confirmed the world has likely permanently passed the threshold of 400 parts per million atmospheric carbon dioxide—a dangerous level that means action on climate change needs to speed up if the world is to avoid going beyond 2°C of warming. 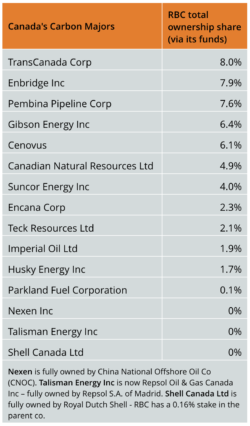 We assembled a sample of 238 fossil fuel companies based in Canada with year-end assets in 2014 of at least $50 million. The top 15 revenue-earners, or “majors”, account for nearly two thirds of the sample’s total revenues. Ownership data obtained from Orbis – Bureau van Dijk, a global corporate information database. Ownership data is current to 2016. Board interlock data was collected in late 2015 from Obis, FP Infomart, and corporate websites and reports. Shannon Daub and Bill Carroll co-direct the Corporate Mapping Project, a research and public engagement initiative investigating the power of the fossil fuel industry. The CMP is jointly led by the University of Victoria, the Canadian Centre for Policy Alternatives (BC and Saskatchewan Offices) and the Parkland Institute. This research is supported by the Social Science and Humanities Research Council of Canada (SSHRC).